How many people do you need in your community in order to ensure its viability and safety? The answer will surprise you. As we’ve several times detailed, to create a secure retreat, you need some sort of community defense program – either in the form of a suitable sized group sharing your retreat with you, or by forming a local ‘neighborhood watch’ program, albeit on steroids and armed for bear. If we calculate the minimum size of security force we need, we can extrapolate from that to get an ideal of the minimum size that a group as a whole can be. Clearly, there’s probably no upper limit that would be a problem for most of us, but – as we calculate in this article – there is indeed a lower limit that may be a challenge in some situations. In planning your security needs, there are two main factors to keep in mind. The first is you’ll need some type of 24/7 perimeter security on watch to give you warning of the appearance of any marauders, and the second is you’ll need a team of armed people to help you fight them off. What Perimeter Do You Need to Patrol and Secure? The first issue is to decide what your patrol zone will be and what your secure zone will be. The two may not necessarily be identical. One of the key things about a perimeter is that everywhere inside it is reasonably secure – the perimeter encloses an area such that people can not cross the perimeter without being detected. For this reason, perimeters usually have some sort of physical barrier so as to require people crossing it to make a conscious decision to do so (meaning that if you find an intruder inside your perimeter, you know they are not there by innocent mistake) and also to make it easier for you to detect them while they are crossing the barrier, meaning you can patrol your perimeter with fewer people. The barrier hopefully also provides you and your fellow sentries with some security so you can’t be ambushed or picked off by distant snipers. Establishing a secure perimeter can be a problem if you have a geographically distributed group of retreat dwellings. You can patrol/secure each dwelling, but you can’t patrol the land between them, which also makes it dangerous for people from one dwelling to travel to another one, whether it be for social purposes or to provide reinforcement in time of attack. Note that the area you patrol – your perimeter – need not be the same as the area you defend. Maybe you have obscured listening/observation posts around your property, but when the sentries at such locations detect people coming towards them, they merely sound the alarm and then stealthily withdraw back to the main defended location. Another situation could have you needing to patrol your fields to protect your livestock from rustling and possibly even to protect your crops from being stolen too. Clearly, the more area you need to patrol, the more people you will need on patrol. Which leads to our next point. Even if you are only patrolling/protecting your own retreat, you can’t just share sentry duty with your spouse during the day, and lock the front door and bolt the windows when you both go to bed at night. You need to be actively looking for threatening people, and you need to intercept them before they get dangerously close to your dwelling. Note that ‘dangerously close’ is actually quite a long way away – a person can sprint almost 100 yards in ten seconds. How much warning do you need to suddenly be ready to defend your house and loved ones from a surprise attack – almost surely plenty more than ten seconds. You don’t want to be woken up late at night to the sound and other sensations of attackers already attempting to crash through your front door, and pouring burning liquids in through any openings in your retreat walls. You need to have sufficient people on sentry duty, at least during the nights, and ideally all day every day, as to ensure you can never be attacked by surprise. At the very least, you need three people to do lookout duty. This would allow for duty cycles of four hours on, eight hours off, every day (56 hours on duty every week for each of three people). Three people means one person always on duty. But there’s a problem with that – and we’re assuming that the area you are patrolling is small enough and laid out so that a single person is all that is needed to adequately patrol it. If you have only one sentry, what happens if that one person is taken out in a sneaky surprise attack? You then have nothing and no-one between you and your attackers. So perhaps you need two people on duty all the time, in the hope that one of the two will survive long enough to sound an alarm – and also doubling the chances of the sentries spotting the bad guys before the bad guys launch their attack. So this means you need six people at a minimum to keep two people on duty all the time. And that is assuming a well laid out retreat and patrol path that allows for one two-man team to effectively patrol the entire perimeter. You might think that in a survival situation, people won’t mind working longer shifts. Union and state/federal labor laws probably won’t apply in such a scenario! That is true, but the reality is that you can’t keep people fresh and alert for more than four hours on sentry duty at a time; indeed, two-hour or three-hour shifts would be vastly better than four-hour shifts. You also need to allow people a chance to be well rested (ie at least one break of at least 8 hours) and to give them a measure of time to just ‘live their lives’ as well. Maybe you could work a schedule with three three-hour shifts, a nine-hour break and two three-hour breaks, but that would be about the absolute maximum for ongoing ordinary operations, and all you’ve done is get one extra hour per sentry per day. In reality, you’ll need to have more than six people on your sentry duty roster. You need someone to coordinate the schedules, you need to allow time for sickness and other special events, and so on. For sure, the six or more sentry personnel can also be contributing to your retreat in other ways when not sleeping or standing sentry duty, but this number – six – represents one measure of the minimum size group of people you need for a secure retreat in a Level 2 situation. This number probably surprises you. Just to stand sentry duty to detect the possible approach of bad guys will require six people, each working 56 hours a week minimum. The good news is that one of the two sentries on duty at any time need not be an adult with skill at arms. One person could be a child – with probably better eyesight and hearing than an adult, a child could be a good sentry, although they need to be old enough to have sufficient concentration span to remain alert for their shift. It is fairly easy to do as we just did, to work the numbers and to decide you need at least six people available to rotate shifts as sentries. But what happens when a group of marauders approach and attack you? Clearly at that point, everyone who can aim and shoot a rifle will be doing exactly that. There’s no such thing as having too many defenders. But there is definitely a problem about having too few. As an awfully absolute bare minimum, you want at least two people able to be your primary fire team engaging the attackers. You then want to still have some sentries, scanning around the rest of your perimeter, looking for additional attackers suddenly appearing from the sides or rear. You also need a support person bringing additional ammunition supplies and anything else that may be needed to the active shooters. This person might also do double duty as a corpsman/medic, in the event that you suffer casualties among your own people. You need at least one person in a ‘ready reserve’. Best case scenario, they do nothing. Neutral case scenario, they are called upon to successfully defend against an attack from a new zone (but this will be one person on your side, and probably two or more attackers – a ready reserve of one is very few, especially when you can’t afford to take people away from your primary fire team either). Worst case scenario, they have to replace an incapacitated member of the primary fire team. So, add that up, and you need 2 on the primary fire team, one support person, at least one lookout, and hopefully plenty more than one person in your ready reserve – five people altogether as a terrible minimum, better six or seven (or eight or nine…). Yes, five people is adequate to successfully defend against one attacker. You might think that you only need two people to successfully defend, from your somewhat fortified position, and while that is sort of true, you need to be alert and able to respond to additional threats that suddenly appear at the same time. So you need five people to be reasonably sure of winning against one attacker (in part because you can never be sure there is only one person). The good news is that you don’t need five more people for each additional attacker. But it would be nice to have at least as many people shooting back as there are people shooting at you, and you do need the support resources too. You’ll probably be faced with many more than one person attacking you. How many should you anticipate? How many people do you think might attack you? That’s a tremendously unknown but important number. It depends a bit on the makeup of the group of people attacking you. Are they an ad-hoc group of people joined together in the common cause of stealing food, or are they members of a traditional gang? Ad-hoc groups are probably going to be at least five in number – any less than that and they’d not feel secure at attacking a defended position and would either leave you alone or join up with other individuals or groups. On the other hand, smaller groups of 2 or 3 or 4 might adopt a stealthy approach and subterfuge – appearing initially as harmless helpless refugees or whatever, getting close to or even inside your retreat, and only then surprising you and overwhelming you in your unprepared state. Anyone who approaches your retreat is a potential threat. We guess ad hoc groups of attackers would tend to be around 8 – 20 people in number. More than 20 gets complicated to manage/control, and becomes vulnerable to ‘splinter groups’ forming and breaking away, while less than 8 and the group will still be keen to recruit more participants. Furthermore, if ad-hoc groups get much larger, they’ll start to delegate duties, and it is reasonable to expect that any initial foraging teams will probably be only eight or so people – this is more than enough to overwhelm unprotected or lightly protected retreats. So for these type of newly formed ad-hoc groups, we guess you’ll be encountering at least five and probably more people attacking you. But, the more secure and impressive your own retreat, the greater the size of the attacking group, because smaller groups will simply pass you by while looking for easier pickings and larger groups will apply more of their force to the assault. Maybe the first team sees your retreat and security, then goes back to the main group and suggests that the initial approach/attack be with a larger attacking force. As for more traditional street gang type groups, that’s a much bigger worry. Way back in 2005, a Department of Justice report estimated there were 21,500 gangs in the US, and 731,000 active gang members. There’s an interesting piece of information in this data – it seems the average gang size, in 2005, was 34 people. A second set of statistics in 2007 claims 30,000 gangs and 800,000 gang members. This works out to a lower count of 27 per gang. Another set of statistics, in 2009, claims 900,000 gang members plus another 147,000 gang members in prisons, but doesn’t provide a count of the number of gangs. A 2011 FBI report estimated 1.4 million people in gangs. We can only guess what the count of gangs and gang members may be now. None of these numbers are exact, but two things are apparent. First, gang membership is increasing at a dismaying rate. Second, it seems likely to expect that most gangs will have between 25 – 40 members. If we look at this number of 25 – 40 people per gang, it seems reasonable to assume that if it is a gang type group of people attacking you, there could be as many as half their members in an attack force, and certainly eight or more people. Perhaps the initial attack might be about eight people, and then after you fight them off, the survivors go back and bring the rest of the gang back for round two of the battle – maybe the second time around you find yourself up against 30 attackers. We feel the gang threat may be the gravest threat you face – see our separate article that analyses gang issues in more detail. There are many other factors that go into determining the size of security force you need. But for this overview, let’s simply say that you need at least ten people who can effectively fight to defend your retreat, and if you can scale this up further, so much the better. Of course, in an emergency, most adults will be pressed into service to defend the retreat, so we’re simply saying your group needs to include at least ten able-bodied arms-bearing adults at a minimum and preferably more like twenty, so as to be able to defend itself against occasional attacks. If your retreat is unusually large, you may need even more people, just so you don’t have any exposed undefended external walls. The chances are your community will not just be exclusively able-bodied adults (and we’re also assuming that all adults, both male and female, will be able to and will agree to bear arms in support of the community). You’ll for sure have some children too, and maybe also elderly people less able to contribute significantly to the defense of the community. If you have 15 able-bodied adults at a minimum, what does that mean for the overall total community size? Will there be another 10 children and elderly? Or another 20? You can of course influence the answer to this question by selecting who you choose to bring in to your community, but the chances are that at the very least, 15 able-bodied adults will mean a total community size of 25. Let’s run the numbers some more about what the minimum size community could effectively be. You’ll be surprised. So, to successfully patrol your retreat, you need at least six people working as sentries full-time (ie 56 hrs/week each). If your retreat or patrolled perimeter is larger than what can be adequately monitored by one single two-man team, you might need 12 people (for two teams) or 18 (for three teams) or some other multiple of six. If your retreat has six adults as sentries, people who are full-time diverted from ‘productive’ duties such as caring for livestock, growing crops, and so on, clearly it needs to have perhaps another six adults who can do productive duties to provide the food and ongoing shelter and energy needs for the group of 12 as a whole. These other six people could double as part-time members of the defense force in the event that an attack eventuates. Remember also that a community will typically have some people who are less productive – retirees and children. Indeed, younger children are not only less productive themselves, but will also drain productive adult resources by needing to be cared for and educated. So we start with six adults, minimum, just for sentry duties. Then another six adults to produce food for the group, now totaling 12. Maybe these 12 people are joined by 8 less productive children or adults, who need another four adults to care for them directly or to indirectly add to the community’s overall food and energy production. And now the four extra adults bring additional less productive companions with them too, and so on, over and over. It is easy to see how the practical minimum size of a single retreat/contiguous community can rapidly swell to way more than 25 people in total, and ideally more like 30 or even 40. Which probably means you split into two or more dwellings (but see our article advocating a multi-unit condo block rather than free standing dwellings), and may need at least one more set of six sentries, plus the support people now needed for them, and on it goes. Before you know where you are, you’re looking at 50+ people, and wishing you had more. We’ve several times pointed out the need to join or create a community so as to establish a viable sized group – not only for defense, but for other purposes too. However, this is the first time we’ve put a number alongside the claim. 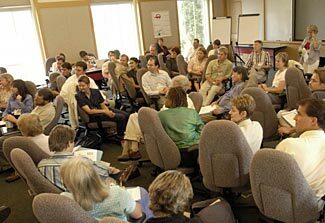 Depending on the physical layout of your retreat(s) and the make-up of your group (as between fully productive adults and less productive seniors and children) you need somewhere between 25 and 50 people as a minimum viable sized group. Chances are you’ll be as surprised at this as we were, the first time we did the calculation. But check our logic, and if you can see some other way of working the numbers, let us know. We started out, probably like you, planning our own retreat for just our immediate family members. Then we decided to invite in a few selected and trusted very close friends, because we sensed that there was safety, security, and strength in numbers. But now that we’ve seen how many people we really need to be more certain of securely surviving a Level 2/3 scenario, we’ve evolved our thinking and are now offering the Code Green Community concept, inviting you to consider joining with us as part of a larger more viable group. Consider joining us by all means. Alternatively, of course you can do your own thing – either close to us or anywhere else in the country. But whatever you do, make sure you do it as part of an integrated group; don’t plan on only yourself, your spouse, and immediate family members going it alone. Whether it is a security problem or something quite different, it is just too risky to attempt to survive in a very small group.